Every year, tornadoes, earthquakes and other natural disasters injure and kill thousands of people and damage billions of dollars worth of property. Often, it is almost impossible to predict or prevent the occurrence of these disasters. However it is possible to reduce their impact by developing a disaster management and recovery planning strategy. This report on Disaster Management and Recovery Planning is a detailed guide for utilities, power plant operators, pipeline and transmission line operators, businesses, governments, communities and emergency operations teams to develop and maintain a disaster management and recovery plan. It outlines the four phases of a disaster: Mitigation, Preparedness, Response, and Recovery and provides detailed instructions on developing a mitigation plan prior to a disaster. The report examines long and short-term goals for mitigation, planning and recovery from disaster along with initiatives that U.S. government has taken in recent years. The report has a special focus on management of energy infrastructure during the time of disaster and presents a checklist for emergency response and recovery. Disaster management is a systematic approach towards preparing for disaster before it happens and includes disaster response - emergency evacuation, quarantine, mass decontamination - as well as supporting and rebuilding society after natural disasters have occurred. Efficient disaster management relies on thorough integration of emergency plans at all levels of government and non-government involvement. Disaster preparedness, emergency management and post disaster recovery is highly dependent on economic and social conditions local to the disaster. However, the basics steps for disaster management remain same in all scenarios. Preparedness is the first step to counter disaster, which involves developing plan of action and it, includes communication, chain of command development, proper maintenance and training of emergency services and development of emergency warning systems along with emergency shelters and evacuation plans. The next step is response, which includes mobilization of the necessary emergency services such as firefighters, police, and ambulance that may be supported by a number of secondary emergency services, such as specialist rescue teams. Recovery from disaster involves restoration of the affected area including destroyed property, re-employment and redevelopment of essential infrastructure. Mitigation efforts attempt at preventing hazards from developing into disasters or reducing the impact of disasters and it focuses on long-term measures for reducing or eliminating future risks. 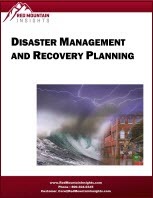 This report details disaster management and various steps from planning to prepare against any disaster. It highlights the role of government agencies and local authorities at the time of disaster as well as before and after it.